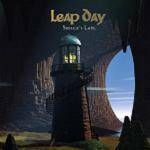 More information: Dutch band LEAP DAY was formed in 2008, but the events leading up to the band formation started a year earlier. Drummer Koen Roozen (Flamborough Head) had been looking for musicians with a desire to play symphonic rock, and in his search met keyboardist Derk Evert Waalkens (King Eider) who was also looking for like-minded musicians. Shortly after vocalist Jos Harteveld (Pink Floyd Project) joined this so far unnamed project. Koen and Derk then started discussing the possibilities of performing the King Eider material at Progfarm 2007. Guitarist Hans Gerritse (King Eider) liked this idea and hooked up for this project, along with bassist Peter Stel (Nice Beaver). They needed another keyboard player for this gig though, and Gert van Engelenburg was asked to join. Gerritse left after the Progfarm gig. The rest of the guys wanted to continue on though, and when guitarist Eddie Mulder (Trion, Pink Floyd Project, Flamborough Head) agreed to join, Leap Day was born. The band's first full length debut album was released in the summer of 2009, named Awaking the Muse.